» What is laparoscopy and how does it differ from traditional open surgery? » Are there disadvantages of laparosocopy? What is the difference between a robotic (‘Da Vinci’) and a laparoscopic radical prostatectomy? » Do all Urologists offer laparoscopy? » What common urological operations does Mr. Chang perform laparoscopically? What is laparoscopy and how does it differ from traditional open surgery? Laparoscopy, also referred to as 'keyhole' surgery, is a minimally invasive surgical procedure where the surgery is performed through very small incisions using specialised surgical instruments. One of the benefits of laparoscopic surgery is that it allows the surgeon to visualise the inside of the patient’s abdomen with exceptional clarity. Laparoscopy is described as 'minimally invasive' because small incisions are used. This contrasts with traditional ‘open’ surgery, which requires large surgical incisions to be made to access the abdominal cavity. As a result of advances in medical science, technology and instrumentation, major procedures, which at one time could only be performed in the traditional way using large incisions, can now be performed using the laparoscopic approach. The laparoscope uses lenses and a bright light to magnify and illuminate the structures within a patient’s body. 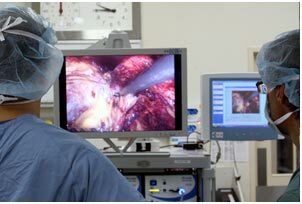 It also contains a video camera, which transmits the images to a television monitor in the operating room that displays the final magnified image. Surgical instruments especially designed for the procedure are inserted through small ports in the patient’s abdomen to carry out the surgery. Current medical literature confirms that laparoscopy provides significant benefits to patients and the wider community. In general, patients experience less postoperative pain and discomfort, have shorter hospital stays, have smaller surgical incisions, achieve a better aesthetic result with less scarring and a more rapid return to work and normal activities of daily living. These benefits are made possible because laparoscopy decreases the stress on the body and reduces trauma to internal organs, thereby facilitating early recovery. Laparoscopy is now the standard of care for many operations previously performed in the traditional ‘open’ fashion such as cholecystectomy (gallbladder removal). Mr. Chang has successfully performed laparoscopic surgery on patients who would have been considered too high a risk to undergo traditional open surgery for reasons such as advanced age, obesity or other serious medical problems. The estimated complication rate of laparoscopic urologic surgery is less than 5%. The most common risks include bleeding, infection, and injury to adjacent organs such as liver, bowel, spleen, pancreas and vascular structures. These complications can also occur with open surgery. Although there are advantages for patients undergoing laparoscopic surgery in preference to open surgery, it can be technically more difficult to perform. 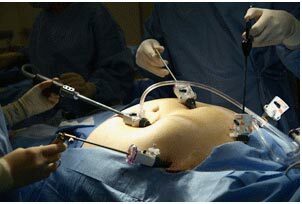 As a result, laparoscopic surgery sometimes takes longer to carry out. Occasionally, in less than 1% of cases, conversion from the laparoscopic operation to open surgery is sometimes necessary to safely complete the procedure. Both of these surgical techniques are ‘minimally-invasive’ and accordingly the benefits of each are the same. In laparoscopic radical prostatectomy, the surgeon stands by the operating table, personally manipulating the instruments. In robotic prostatectomy, the surgeon is seated at a robotic console away from the patient on the operating table. At the console, the surgeon ‘drives’ the robotic instruments to perform the operation. For more information, click here. Not all Urologists offer laparoscopy and it is well recognised that there is a steep learning curve in expertly performing laparoscopic urologic surgery. If you are considering laparoscopic surgery, it is important that your chosen specialist has undertaken specialised training, and/or a supervised fellowship in the technique. Not all urologists offering laparoscopy are capable of performing advanced laparoscopic procedures such as laparoscopic partial nephrectomy (removing part of a kidney by keyhole). Mr. Chang is able to perform both common and advanced laparoscopic procedures including laparoscopic partial nephrectomy and laparoscopic radical prostatectomy. Not all urologists offering advanced laparoscopy are capable of performing this surgery through the patient's front (transperitoneal) or through the patient's back (retroperitoneal). The retroperitoneal approach enables patients who have had prior abdominal surgery to still have a laparoscopic operation which otherwise may not be possible through the front. Click here for details of Mr. Chang’s qualifications and training.